Through struggle and with diligence, Gary Weeks & Co. has created a production furniture business based primarily on the rocking chair. The Weeks rocker was introduced in 1993, and the seven-person shop completed its like-stone 1,000th rocker last October. In between, Gary Weeks changed the business from construction to furniture-making, streamlined the building process, developed a national marketing strategy, and built a new shop and showroom in Wimberley Texas. Weeks, patriarch of the family-oriented business, takes a moment to consider the events of the past decade and points to a rocking chair - No. 1,000, gleaming with a Danish oil finish on carefully selected pecan wood - as the reason for any success. “You build something, 300 people sit in is and 298 break into a great big smile, you know you’re onto something,” he said. Weeks & Co. grew out of a contracting business, which started about 30 years ago. In a shop established to make cabinets, doors, sashes, and millwork, furniture-making began to emerge while Weeks’ interest in competitive bidding waned. 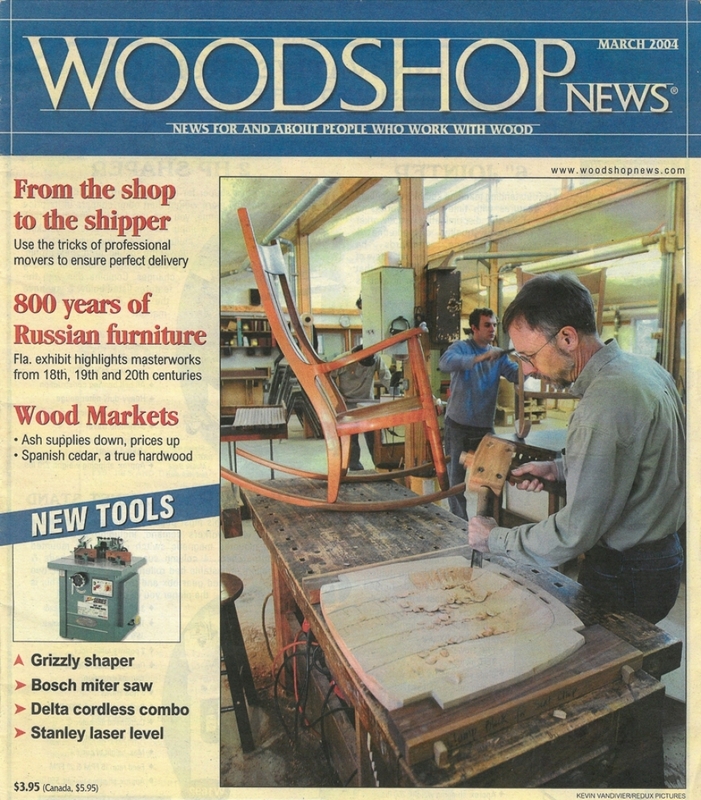 The shop transitioned to full-time furniture production about five years ago, though the rocking chair design is at least 12 years old. There have been good days and bad. Weeks & Co. was starting to show a small profit on furniture when it lost the lease on a ranch where the shop was located. A new shop had to be built, and making furniture was put on hold for about six months. Weeks’ wife, Leslie, manages the office, while sons Austin and Zachary - on breaks from engineering studies at Texas Tech - work in the shop. Austin has competently assumed the lead woodworking duty. The chairs sell because they’re comfortable, well made, and priced to be a value, according to Weeks. “I consider the price essential to the success. I’ve had a lot of people say you’re selling those too cheap. I try to make a little on them. The more we can move out, the better and faster we can make them. If your goal is to make them better and faster, you can. But you have to have plenty of opportunities to make them do that. The cherry rocker sells for $1,600, while maple and walnut chairs go for $1,650. A mahogany version sells for $1,700 and, when the wood is available, there’s a mesquite model for $3,700. Weeks started selling the rockers for $800, renting floor space at an antique mall in Austin, Texas. He was losing money on each chair, but was trying to establish a market. The venue and approach proved successful. “This was an upscale place and kind of a tourist destination. It was just a good place to be. I rented that place for five years and that really gave us a good start,” he said. “I’ve done shows - I don’t do shows anymore - advertised in the Texas Monthly, Atlantic Monthly and The New Yorker; and Taunton Press’ old magazine, Home Furniture, which was the best venue.That got enough chairs now and then remember it because they’re comfortable. So that got us a little momentum. And now the Internet is bringing us a lot of business. Weeks has also put a lot of effort into a catalogue, which he feels has added legitimacy and credibility to the marketing effort. The catalogues are only sent to people who request them. But the end result is a huge - and necessary - marketing nut. “You can’t sell the stuff without spending some money,” he said. “Or I can’t. Advertising, particularly, just takes a leap of fifth and weathering some losses, because not all those ads are going to work. They’ll pay for themselves, and that’s about all they’re going to do. It’s not like hitting a home run, but you can hit a series of singles. About 60 percent of Weeks’ furniture is shipped out of state, and shipments have been made to 44 states, Europe and Australia. Weeks estimates that 25 percent of the sales are generated from the Website, people who see the furniture in the homes of friends. The goal is to have chairs ready to ship in five to ten days upon receipt of an order, and that goal is being accomplished. Shipping the furniture without incidents has also been mastered. Weeks worked his way through college on the freight docks, which he said has done wonders for his crate-building abilities. Parts of the rocking chairs are built six or eight at a time. To a point, everyone in the shop can make a chair. But some of the sculpting requires unique skills and carries risk, so it’s left to the more experienced workers. Considerable time is also sent selecting wood and matching grains. Weeks was a bit guarded on the actual time required to build a rocker, but the process has been streamlined over the years to include the use of jigs, fixtures, specialized tools and machines. The process is covered in some detail on the company’s Website. The shop generally assembles a chair or two a day, with the staff perfecting the steps leading up to the final fit and sanding. The style of the rockers is a mystery, even to the maker. The chairs can be customized by contrasting woods or inlayed symbols. But the shape or size of the chair is never changed. Weeks has found that customers who have bought a rocking chair are often interested in other pieces of furniture, so he’s expanded his product line to include side tables and stools - made from cutoffs from the rocking chairs - dining tables and chairs. Weeks is more certain on the mass appeal of rocking chairs. “It’s a piece of furniture that generally has a place in people’s homes. They’re often purchased when children are born or people retire, so that attaches a little significance to them. And it’s an American phenomenon, largely. There’s a certain significance attached to them that often makes them heirlooms. And therefore, people who might not otherwise buy handmade furniture are a little more willing to invest. Weeks & Co. returned to construction in 2000, spending six months building its 2,600-sq. Ft. shop and adjacent 1,200-sq. Ft. showroom, and finishing building. The business had been operating from a leased bar, so the move had added a sense of permanence along with some creature comforts. The showroom is somewhat of a luxury, but corresponds with Weeks’ overall marketing efforts. Wimberley is in the Texas Hill Country, about halfway between Austin and San Antonio, and gets its fair share of tourists. Weeks doesn’t flag them off the main road but he’s savvy enough to invite them in if they knock on the door. “I used to advertise locally to get some tourist trade, but it really wasn’t very effective. We had to talk to a lot of people to sell anything so I don’t encourage tourist traffic. But because we run ads and have a large word-of-mouth reputation, there are a lot of people who want to come here. And we want to have something to show them. It’s a showroom with a low profile, and that’s what I want,” he said. The plan for the future won’t differ much. The second thousand rockers will probably be made quicker and better than the first thousand, but the quality will always remain high, says Weeks. The marketing and construction details have kept Weeks away from the shop. He hopes to return for “at least” a half-day to do the final sanding, some of the setups and maintain the machinery. But he’s also thinking about another design - a bigger rocker to accommodate those 6’ 3” and taller. And making people happy is the ultimate goal of Weeks & Co.